RICHIE POWER HAD just had his third operation in ten months when the surgeon who performed the procedure dropped the bombshell. He told the eight-time All-Ireland winner and two-time Allstar, that he would, more than likely, never play for Kilkenny again. “To be honest about it, there were tears in the room”, Power says. That was last October, just weeks after he had made a twelve-minute cameo in the Cats’ four-point victory over Galway – their 36th All-Ireland title. In January, Power announced his retirement from inter-county hurling but he had known for months. It just took him some time to properly get his head around it. “You don’t expect to be told that, at 30, the likelihood is I may never run again”, says the Carrickshock clubman. He desperately wants to return to action later this year. What’s driving him is the possibility of getting back to his roots. But he’s aware of the risk. In the last fourteen years, he’s had six operations on his knee. There’s no cartilage left anymore. It’s just bone grinding against bone. His training is restricted to gym work – the bike and the pool – anything that can help build up the muscles around the knee. But push too hard, even at club level, and Power could break down again. “That’s hard to take. I’m clutching at straws, maybe, trying to get back to the club”, he admits. Power can trace the injury problems to two defining moments in his career. The first came as a teenager when he was training with St. Kieran’s College. “That was when I had my first keyhole operation”, he says. In April last year, after tallying 2-01 in the 2014 All-Ireland win over Tipperary the previous September, he was faced with another setback. He dug deep to get back for the summer but a return date kept on being pushed further and further out. For five months, Power pushed himself in the gym every night. Two weeks before the All-Ireland, he still wasn’t sure he’d make the panel. But, against the odds, it worked out. Kind of. His eighth and final Celtic Cross will also feel a bit less than the others. Does he have regrets? The Kilkenny class of 2016 don’t seem to be missing him too much. There was an opening day league defeat to Waterford but they’ve followed it up with back-to-back wins over Tipperary and Galway. Next up is basement side Cork at Pairc ui Rinn on Saturday night. Power isn’t surprised that the Kilkenny machine shows no signs of stopping, quick to point out that they’ve been here before. “When we had the bulk of retirements after 2014, a lot of people were saying that there was no way this Kilkenny team could come back and win an All-Ireland. Kilkenny aren’t going to miss anyone from the team that started the All-Ireland last year only Ger Aylward. They’re going back defending their title with fourteen of the fifteen that played the All-Ireland last year. And what of the troubled Rebels? Their intense rivalry with Kilkenny seems a long time ago now and with a mammoth 5-68 conceded from their three games so far and coming off the back of a demoralising defeat against Dublin, confidence is at an all-time low. Power has been surprised by the regression. “I go back to 2013 when they beat us in the quarter-finals in Thurles. I just said ‘These guys are here to stay’. They were a very young team and I can’t really understand how they haven’t made that progression. So is Power. His goal is to feature again for Carrickshock and he’s earmarking a return to club action in July or August. He’s hungry for it. And he’s clinging to the possibility. “Eleven years on the senior panel and fifteen with Kilkenny – it leaves a huge void. But, it allows you to go back to the club scene and go back to the guys you’ve hurled your whole life with. It’s been great to get back and get involved but I just hope I can play towards the end of the year. 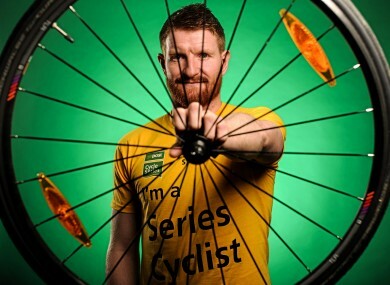 Richie Power was speaking at the launch of the An Post Cycle Series which runs between May and September this year with five events taking place around the country. More information can be found at www.anpost.ie/cycling. Email “'To be honest about it, there were tears': Richie Power on coming to terms with walking away ”. Feedback on “'To be honest about it, there were tears': Richie Power on coming to terms with walking away ”.